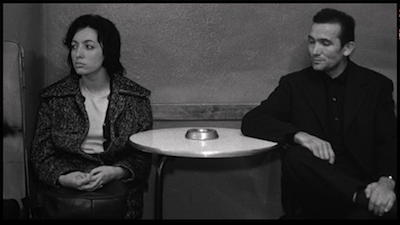 Ermanno Olmi's 1962 drama I Fidanzati (The Fiancés) takes the cliché that long-distance relationships always fail and turns it around. The Italian writer/director explores how romance blossoms when his titular lovers are separated by work and then steps back to see if it can thrive under these unnatural conditions. 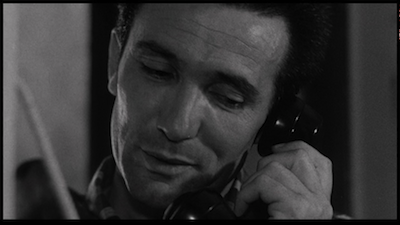 Carlo Cabrini plays Giovanni, a factory worker engaged to Liliana (Anna Canzi). We meet them on a night out in Milan, their hometown. They have gone out dancing, but they are in the middle of a fight. Giovanni has been offered a promotion in Sicily, a step up he can't refuse no matter how much his fiancée wants him to. 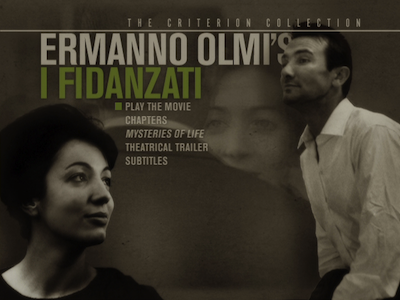 In these efficient and expertly edited opening scenes, Olmi sets up the style of I Fidanzati. The conflict isn't expressed in the dialogue of the argument, but rather by jumping around in time, seeing Giovanni get the offer and how he breaks the news to Liliana. This is how the whole film is told, as a jumble of memory. Though there is one thread that goes through I Fidanzati, Olmi shows us how the past causes tremors in the present, how a tweak on one end of that story line can cause vibrations further down. Giovanni moves to Sicily and starts his new job. He gets a room first in a hotel and then in a boarding house. He meets co-workers who are also transplants, and he travels the town to see how the locals live, including visiting the outlying farms and also the church. Life is familiar, but different. He is an outsider, and he never quite fits in. Even the punishing weather reminds him that this is not home. It's hotter than he is used to, the torrential gales more dangerous. I Fidanzati is a portrait of loneliness. Giovanni wanders his new digs as a man apart. His melancholy stirs up more memories, including ones that aren't so good, when he treated Liliana poorly. Olmi draws a subtle parallel between Giovanni's plight and his elderly father, whom he placed in a nursing home before departing. The caretakers tell Giovanni that life will be good for his father, but the old guys tend to have a hard time adjusting to being left on their own this way. They feel abandoned, and if they don't adjust, they waste away. Now that he is in exile, Giovanni could suffer the same fate. Eventually, letters from Liliana become his lifeline, and they grow closer via the openness of this new communication. Liliana even sees the irony--when they were together, they didn't talk nearly as much. It would be easy for all of this to become a jumble, but Olmi and his champion editor, Carla Colombo, keep it well organized and never lose the viewer in the nostalgia and longing. 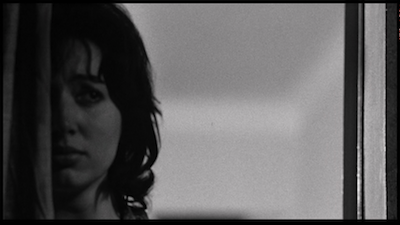 Part of the clarity comes from the simplicity of Lamberto Caimi's camerawork. 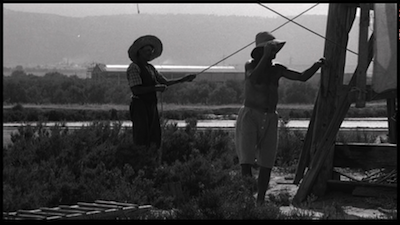 As with Il Posto [review], he and Olmi adopt a Neorealist style, avoiding any sweeping movements or camera tricks. Giovanni's tour of Sicily looks more like a documentary than a fictional film, and when he goes to a local festival, it's clear that this was a real celebration shot on location. 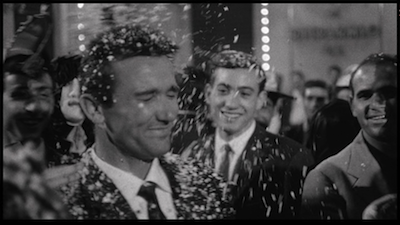 The result is like the missing link between Fellini's big party in I Vitteloni and the carnival in Camus' Black Orpheus [review]. The realism keeps us grounded as the flashbacks grow dreamier. A scandalous trip to the beach is illuminated with idyllic sunlight, while the memories of early rendezvous with Liliana come quicker, like a greatest hits reel of young lovers. * Though I hadn't seen I Fidanzati when I wrote it, this was actually the intention of the finale of 12 Reasons Why I Love Her , my graphic novel with Joëlle Jones.